The main reason I wanted to stay here in the Blue Ridge Mountains, was because I could teach my children how to live simple and grow your own food. Here in this area canning, drying and preserving food, is still a means of life. I went back to my roots and have started to do this in our family. This page is to share techniques and recipes with you, so maybe you can enjoy these things too in your life. I do hope you find this useful. I remember moving into my first home and running to the bookstore to find the Betty Crocker Cookbook that my mother had when I was growing up, or one similar. I was 18 when I got this cookbook and I have used it ever since. This has to have the best recipes in it for everyday cooking. Last year I was so upset, because my first cookbook was in pieces. I had 5 different parts to the cookbook. The front cover had fallen off and the index page looked like a mouse had gotten ahold of it. My family went on the hunt for a 1986 Betty Crocker Cookbook, and they found one to my surprise. This to me has been one of the best editions from Betty Crocker. If you find one hold on tight, it’s a good one for home cooking. As promised a donut recipe we have used here and at the local Farmer’s Markets. Mix all you wet ingredients into a mixer or a bowl. In another bowl sift all your dry ingredients together, add these to the wet. Wrap your dough and put into the frig for about an hour. On a well-floured surface roll out the dough to about a ½ an inch thickness. Dip your cutter, which for me is a tin can into flour and cut out your donuts. For your fryer, I use a cast iron stew pot for mine. Pour about 2 to 3 inches of oil into it and heat to 325 F. Do not over crowd your pot and fry for about 2 min. on each side. When done, use tongs and take them out and place in a paper bag to soak up oil our on a rack with a paper towel to soak up the oil. Mix all ingredients in a bowl and then whisk until smooth. I put a rack over a bowl to glaze my donuts to help with the clean-up and not to waste the glaze. 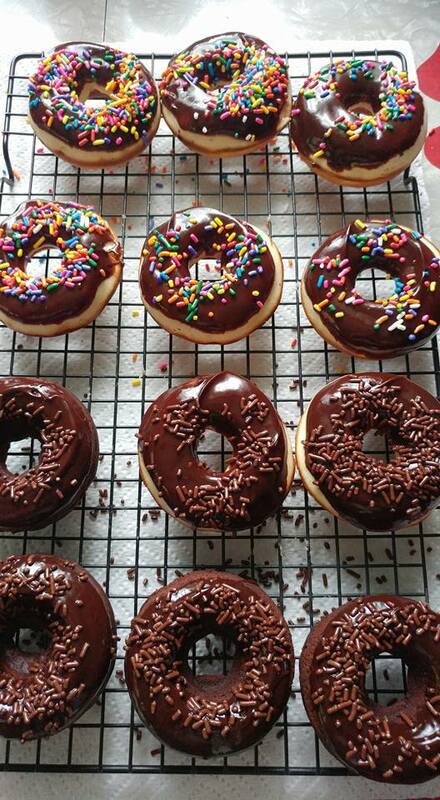 Dip each donut while still warm into the glaze and place on the rack to drip. Once it stops dripping place in a container or eat! There isn't a recipe for this month but we wanted to share that at our local Farmer's Markets Ms. Ayla and I will be baking. We will share our recipes very soon, but since I didn't have many pictures of us baking them, decided that hopefully by next months Blog we will have them. This year I am making donuts and Ms. Ayla is yet again making her pound cakes! Hope you can catch us at the Market! This is a recipe that I have made and perfected over the years. I had tried many recipes for potato salad and I just really never found one I liked. I started off with an old recipe of potato salad I had found in my cookbook and made my own recipe. I hope you all enjoy this recipe as much as all my friends and family do. 6 medium potatoes, 1 ½ cups Mayo, 1 teaspoon salt, ¼ teaspoon pepper, 3 hardboiled eggs, ½ cups of olives. I start off by peeling and then doing a large dice on my raw potatoes. Each piece will be about an inch large, sometimes larger. I then boil these potatoes until they get soft, then drain them. While doing this I am boiling eggs. I let the potatoes, cool a little before I start adding everything into the bowl. I dice my eggs and my olives, then add them to the potatoes, mix in your mayo, salt and pepper, until the potatoes get almost like a mash potato consistency with chunks. This I have been told is what makes the potato salad along with the olives. There isn’t much to this, but I actually have people asking for doggie bags for the potato salad before they leave and sometimes have to hide a bowl so we have leftovers! I do hope you enjoy this as much as we do. I have shared my pie recipe and technic with my daughter Ayla, on how to make a good pie crust. She now is taking it over and has been very successful at our local Farmer’s Market in Independence Virginia. I told her yes a good recipe helps, but the technic is the key, on how you make a good crust. I will share with you all the recipe we use here at Cranberry Acre and try to describe the technic the best I can. In the future we may do a video! Now I add to the mix bowl my flour, lard and salt and proceed to cut it with a pastry cutter until it is well mixed and starts to form into clumps. If it is a warm day and is humid, I will add only the 2 tablespoons to the mix. When mixing the water, I flour my hands and dig in! I mix with my hands. If it is too dry, just add the last tablespoon, to wet add about 2 tablespoons of flour to the mix. Now if it is a dry day, like winter with the heat on, add all the water no matter what. Once the dough can be formed into a ball without falling apart, I flour my table top and my rolling pin. Then I start by rolling out until it is about the diameter of a small plate and flip the dough and then roll it out to a dinner plate size. Now if the dough sticks, add a small amount of flour to the top of the dough. You now have a pie crust that is ready to be filled! This recipe I actually found on the internet and we just love it. I shared a picture on our Facebook page and everyone wanted a recipe for it so here it is. Now we added some stuff to our shells. I also added 1cup of chopped green olives and we sometimes add fresh diced tomatoes to it, usually around 1 medium size tomato. Brown your ground beef or turkey, while you are doing this go ahead and start boiling your water for your shells. A box of shells is usually too much so I take out a handful of shells before I dump in my water and just save them for the next time. Once your meat is browned, add your taco package, refried beans and whatever else you decide to mix in. If water is boiling add your shells and let them cook for about 10 minutes in the boiling water. After 10 min drain and let them cool. Pour a thin layer of sauce in the bottom of a 10x13 pan. Set oven to 350 degrees. After you pour the sauce in your baking pan, start stuffing your shells with your taco mix and put in the pan. After you have filled your pan sprinkle the cheese on top and bake for 25 to 30 min until the cheese is brown. I found an old recipe book at a yard sale called Cooking on Hazel Creek. This book has some of the best old time recipes I’ve ever seen. One of these is this pound cake recipe. Cream eggs, sugar, shortening and milk. Add flour and mix. Add flavor and salt. Bake in a well-greased and floured tube pan at 325 for about an hour. Now this is a great cake base for adding fresh fruit or even chocolate chips. When adding the fruit gently fold them into your cake batter and do not add them by a mixer. One of our favorite things for supper is Breakfast for dinner. We wanted to share the recipe we use for our pancakes. Now there are many recipes to use, but this one I think has been the best to modify for putting fresh fruits or even making buttermilk and buckwheat pancakes. This recipe below is just the standard Pancake recipe. 3 tsp baking powder and ½ tsp salt. I tend to not follow well the actual recipe, but have baked and cooked so much that I kind of fall into the routine of things. I always start out with eggs( our girls eggs ), milk and sugar. I mix these in together and then add my melted lard. I then add my salt and baking powder, followed by my flour. You want the mixture to be on a thin side, not like cookie dough or like a brownie, so if it is one of those add 1/8 a cup of milk to thin it out. I always cook on cast iron, it is the only way I know how to. When I am mixing my ingredients I turn on my burner to warm the skillet and the plop of butter. I usually use medium heat on the burner. You want the skillet already hot before you add a ladle of pancake batter. If it is not hot then your batter will run to the edges of your pan and make a mess. Now this is something I’ve learned over the years, you want to watch your pancake as it cooks. You want to see the bubbles form and then pop! I wait until I see more than 4 to 5 bubbles popping at the same time, to flip my pancake. You end up with a pretty brown on that side and it is firm enough to flip and not break on your spatula. Then I wait about 2 min to check the brownness on that side. Then you are done! Now if you want, which my family like, you can add chocolate chips or fruit when you first add pancake batter to your skillet. I like mine plain, but will add fresh fruit after they are cooked to my syrup. I do hope you enjoy this and have the time to try it out.